Welcome to our next 'Did You Catch That!?' article capturing the action from Week 5 in the Big Brother House. I'll be covering everything that's happened since the 4th eviction of the season on Thursday night up until Tuesday night on the Live Feeds. I'll include all the Live Feed action and newest episodes covering the new HOH's, nominees, Battle of the Block and PoV spoiler. When we left off last week it was looking like Brittany was on her way out the door Thursday night. But first, let's check out the action from Wednesday night's episode covering the PoV Competition and Ceremony. But it ended with Caleb giving Victoria the PoV by taking the $5,000 instead. 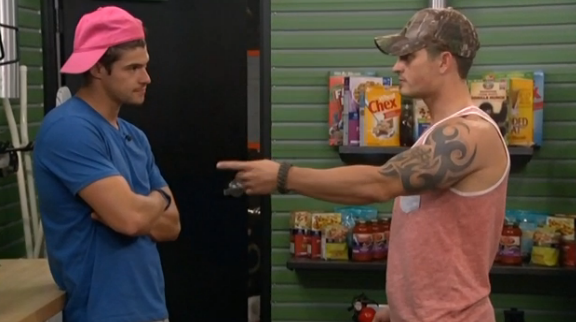 Cody was dead set on nominating Caleb in Victoria's place and even shook Donny's hand telling him he was safe. When it came down to it, Cody couldn't pull the trigger and nominated Donny anyways. Brittany is the only one in danger of going home at this point and it's looking like a unanimous vote yet again. As suspected, Brittany was the 4th HG evicted from BB16 with a unanimous 10-0 vote. 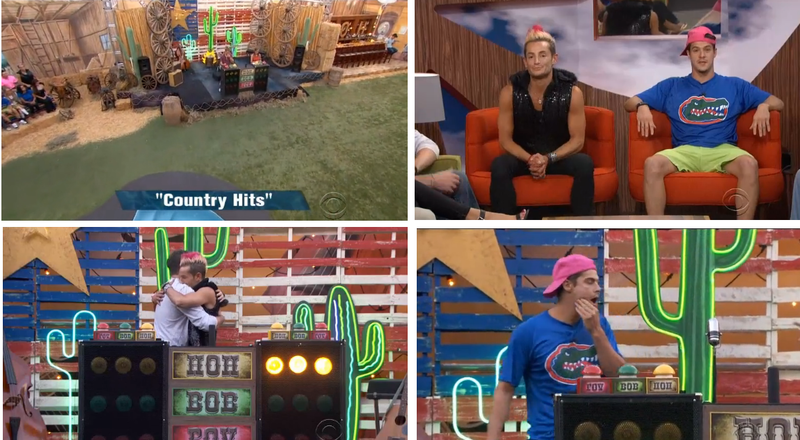 The new HOH competition "Country Hits" had the HG's try and guess which competition the song they heard was from, either PoV, HOH, or BoB. The last 4 HG's left in the competition were all Detonators. Derrick gave Frankie the 1st HOH so he could see his grandfather and Zach beat Christine to take the 2nd HOH spot. I'm sure things would have been very different if Christine won over Zach. As we'll see this week, the Detonators are already breaking in a few different ways. We'll get the HOH room reveals tonight on the Live Feeds. As soon as the feeds turn on we have Zach running through pretty much every scenario possible with any HG's that will listen. Originally he did want to try and convince Caleb or Amber to go up and throw the BoB competition, or have Hayden or Christine go up and throw the BoB competition. No one is interested in jeopardizing their game so Zach can have an easy week. Zach was most upset by how Christine wouldn't take one for the team and demonstrate her value to the alliance by volunteering to go on the block and throw the challenge to make sure Amber stays up with her. Later on in the night is when he was up in the HOH room asking the guys if Christine brings anything to the table for their group. He answers 'No' and adds that all she does is listen to their game play and strategy without contributing much at all. Before the HOH rooms were revealed we had a Team America meeting in the Hive Room where Donny filled Frankie in on their new mission to get 2 HG's to have a heated exchange during a ceremony that lasts at least 20 seconds. It was a nice HOH room reveal Thursday night with Frankie getting a letter from home about his grandfather and Zach getting a letter from his broski. At this point in the night, it appears that Frankie is planning to nominate Jocasta with Victoria and Zach still trying to figure out the best way to backdoor either Caleb or Amber. Zach is up in the HOH room telling Frankie that it could be Christine that goes up in a plan to backdoor Amber. Frankie agrees that the plan should be to backdoor Amber before Caleb, but to use him as a backup if needed. The Detonators are pretty much broken at this point with Zach and Christine not being on the same page. Cody and Derrick have already formed a final 2 deal and call themselves the Hitmen. The members of any alliance Zach has been a part of recognize that he's a loose cannon but need to keep him close for now. If the same side of the house keeps winning HOH, it could be Amber, Caleb, Jocasta, Victoria and Donny as the next 5 out of the house. This could be the last week involving the dual HOH twist which gives next week's HOH competition that much more meaning. Zach and Frankie have been going back and forth between who they should nominate for most of the night and it seems that Zach will do pretty much whatever he wants even if that includes teaching an alliance member a lesson in the process. BB wakes up the HG's around 9 AM BBT and we see the 'Nominations Today' message on the TV screen. Team America had an early morning meeting where Derrick and Frankie filled Donny in on Zach's plan to nominate Christine and make fun of her. They all decide this is the perfect opportunity to complete their mission. Last night Zach was practicing his Nomination speech for the guys in the HOH room and was planning on calling Christine out for being a floater, and Nicole for being a "super fan." 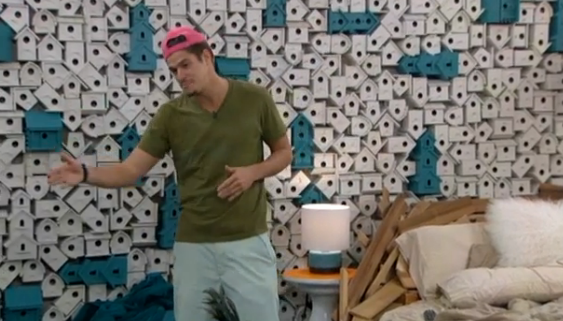 Frankie runs up to the HOH room to make sure Zach follows through with his speech. 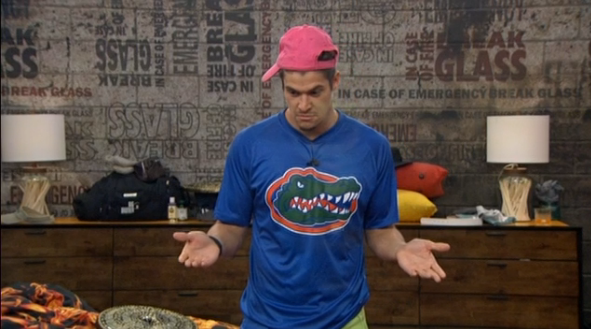 Zach is going to be putting Christine up on the block next to Nicole, while Frankie puts up Jocasta and Victoria. BB blocks the live feeds until around noon and when they come back we learn that the nominations went according to plan and that Zach did torch Christine and Nicole during his speech. The nominees will battle it out in the BoB later today. Most of the house agrees that Zach is power tripping and hopes that he loses his HOH by having Nicole and Christine win the BoB. BB blocks the feeds again for the Battle of the Block competition. The feeds return around 4 PM BBT and we learn that Nicole and Christine won the competition and have saved themselves for the week. Frankie is now the HOH for the week and will compete in the PoV competition with Jocasta, Victoria, and 3 others. Zach and Frankie are still sticking with the plan to backdoor Amber this week, hoping that she doesn't get picked to play for the PoV. Hayden and Nicole have an interesting conversation about who they should be working with moving forward. They both like the idea of working with Derrick, who has approached them about an alliance, and they're both aware of how the house views Christine as someone who doesn't bring anything to the table. It looks like Nicole is starting to take what Zach told her to heart and isn't 100% trusting of Christine. Frankie walks in and Hayden tells him they're still on board with the plan to backdoor Amber or Caleb this week. Frankie tells Christine that the worst case scenario this week is if someone wins the PoV and doesn't change the nominations, then Jocasta would go home. We got more bad news on Friday night as Derrick found out that his grandfather has also passed away. 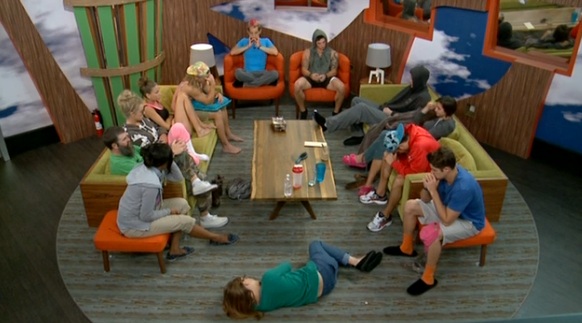 All of the HG's stayed with Derrick in the living room for a while and made sure there were there for him. It's been an emotional week for the HG's. As the night rolled on, most of the discussion was about the PoV and possible scenarios for who would use it. Caleb knows that Amber is somewhat of a target for telling half the house that her goal is to target the guys, specifically Zach. Zach and Derrick talk in the Fire room about needing to go after Amber before Caleb. They both know that she will target them if she wins next week, and they know Caleb is somewhat on their side still. The goal is to evict Amber while still keeping Caleb under control, which may not be easy. Nicole was free of her Germatard at midnight on Friday and gave the Live Feeders, and Hayden, a special Germatard strip show. Much of late Friday into early Saturday was filled with conversations about who would use the PoV if they won the competition tomorrow. Most of the house seems to be fed up with Zach at this point but there's no chance Frankie is thinking about dealing with him so soon. BB wakes the HG's up around 9 AM BBT and we start out our day with another Team America meeting between Frankie and Donny in the kitchen. They're thinking Zach and Amber might get into it during the PoV Ceremony but it may not be that easy with him losing his HOH this week. After a short feeds block we learn that Hayden, Christine and Donny were picked to play for the Veto along side Frankie, Jocasta and Victoria. After knowing who's playing for veto, it seems like anyone who wins would actually use the veto to save one of the two HG's on the block so they can follow through with their plan to backdoor Amber. We also found out that Hayden was picked to play in the competition by Victoria, I guess thinking that he would save her from the block. The feeds were then blocked for a few hours and returned around 4 PM BBT. Hayden has won the PoV and told Frankie he plans on using it on Victoria because she picked him to play. Frankie needed the veto to be played so he's happy to hear it and I'm sure doesn't really care who he uses it on. He and Frankie were talking up in the HOH room after the competition about whether Amber or Caleb was the best option to backdoor. They both know that Caleb won't put them up and plan on breaking the news to Caleb in a way that gets the point across that Amber is straight up playing him. Later on in the bathroom, Hayden tells Victoria that he's using the veto to save her, 100%. Zach and Caleb have a conversation in the storage room about breaking the news to Amber that she is going up but that she is 100% safe. (Not true, but Caleb doesn't need to know this yet) Nobody plans on telling Caleb or Amber that she's in any real danger this week, which should make for an interesting eviction if it holds up. 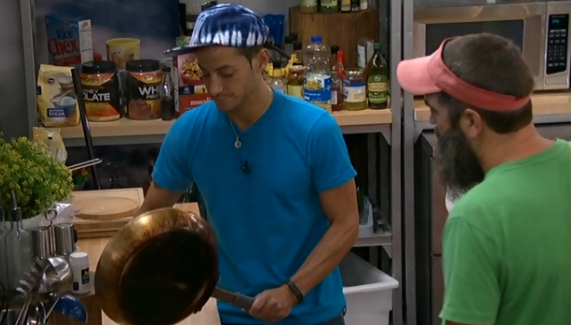 Frankie is filling in the other HG's about the plan to use the veto of Victoria and backdoor Amber. Everyone is on board with the exception of Caleb and Amber who would rather Hayden not use the PoV, but they're not privy to the situation yet. Hayden, Cody, Amber and Nicole capped off the night with an epic fish/pillow fight around 4:45 AM BBT on Sunday morning. BB wakes the HG's up around 9 AM BBT and we have Caleb and Frankie talking alone out in the backyard. 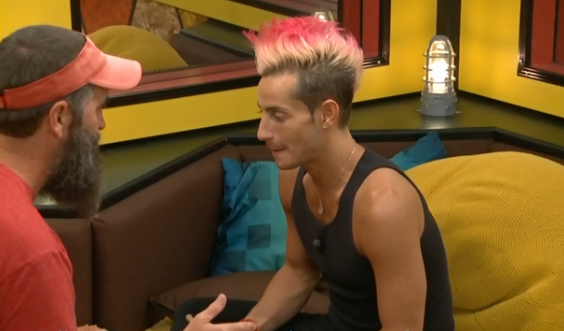 Frankie is telling him about the plan for Amber that he has already heard via Zach. 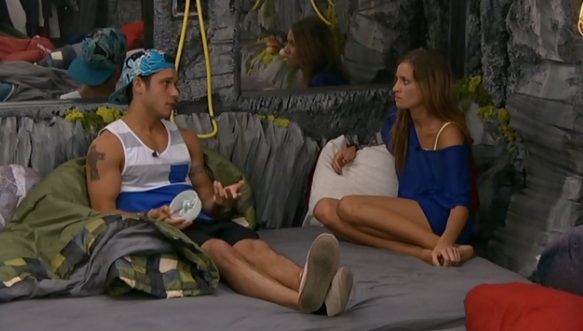 Frankie then goes on to tell him how much crap Amber talks about him behind his back. He says that he will be putting her up and then they'll decide if she should go or not. (She's going, they just need to go about everything the right way with Caleb) Frankie and Derrick both made a point today to make sure Caleb knows how much Amber really doesn't like him at all. Most of the HG's are in bed until around noon on Sunday with BB letting them sleep a few extra hours. Donny and Derrick are in the backyard talking about their Team America mission. They both agree to get Zach worked up before the PoV ceremony on Monday morning to try and get him to fight with Caleb or Amber. Caleb is now fully on board with the Amber plan and thinks she hasn't been thankful for everything he has done for her in the game... whether she wanted him to do it or not. Caleb and Zach agree that it's best if she didn't find out. The HG's had a service on Sunday night for Frankie and Derrick's grandfathers who passed away earlier in the week, led by Jocasta. Later on Sunday night, Zach is practicing his speech about how much Amber doesn't appreciate the Beast Mode Cowboy to Caleb and Derrick up in the HOH room. Derrick, of course, is egging him on because this is his chance at completing the Team America mission. 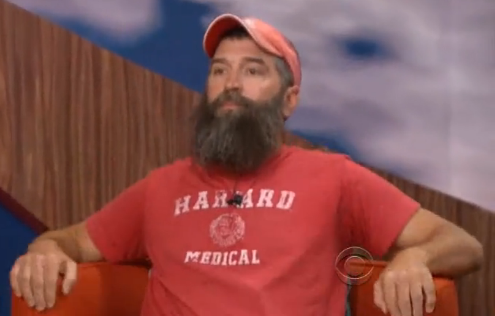 He's been pumping Caleb full of hot air with this speech he has planned for the PoV Ceremony. At this point, Caleb has gone full circle and now believes it was his idea all along to put Amber up and give her a scare. 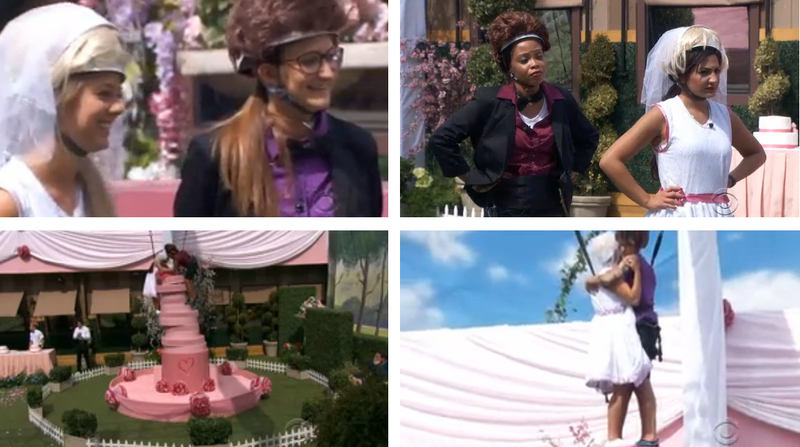 I'm sure Zach's speech will be explosive but I'm not sure Amber fights back to give Team America their completed mission. This brings us to our Sunday night episode where we'll see the nomination ceremony and BoB competition. We get to see Zach and Frankie's nominations and the BoB competition during Sunday's episode. It's Zankie week in the BB16 house this week and some of the HG's have been waiting to see what Zach has planned for his nominations. I know Zach was practicing his speech earlier in the week but I'm not sure they thought he would dig into the girls as much as he did. At first it seemed obvious to put up Jocasta, Victoria, Donny and Amber. The first 3 beings the pawns with Amber being the target. After Christine rejected Zach's plan of having her throw the BoB to ensure Amber goes home, he turned on her and decided she deserved to be on the block regardless. Frankie's nominations were as expected, Victoria and Jocasta. Zach, on the other hand, flipped the script and put Nicole and Christine on the block. The plan this week is still to backdoor Amber, but Zach lit into his nominations calling Christine a floater and Nicole a "Froot Loop Dingus." Team America's mission this week is to get 2 HG's to have a 20 second argument during either the Nomination or PoV Ceremony. They egged Zach on to make a scene at the Nomination Ceremony, which he did, but it wasn't enough to complete their mission and will have another attempt at the PoV Ceremony. The Battle of the Block competition took place and had the nominees trying to stack a cake using the pieces they were given and then climb it before the other pair finished. Nicole and Christine beat Jocasta and Victoria rather easily and ensured their safety for the week. Zach is no longer HOH and much of the house breathes a sigh of relief, except Amber. Amber was the target regardless of whether Zach or Frankie remained HOH. If she happens to get picked for and win the PoV competition then Caleb would be the backup plan. We'll see that action on Wednesday's episode, although we know Hayden has won the PoV already. BB wakes the HG's up around 9 AM BBT and much of the buzz around the house is about Zach's planned speech to Amber during the PoV ceremony. Frankie is telling the crew that Caleb has filled Amber in on the whole plan for evicting her this week and now he wants her to stay. Amber was starting to figure it out anyways with Zach having a speech planned for her ahead of time. She's talking to Caleb in the Hive Room trying to count votes and she's not thinking she'll have the numbers to stay at this point. She's getting worried after hearing Donny and Christine talk about an alliance with Jocasta and Victoria. Hayden and Donny talk some game out on the hammock Monday night about who they'd nominate next week. Hayden doesn't talk a ton of game but both he and Donny seem to have a solid grasp on the players in the house and what exactly is going on. They both agree that Derrick and Frankie will be the 2 toughest HG's to beat at the end, but that Caleb should be their short term target. 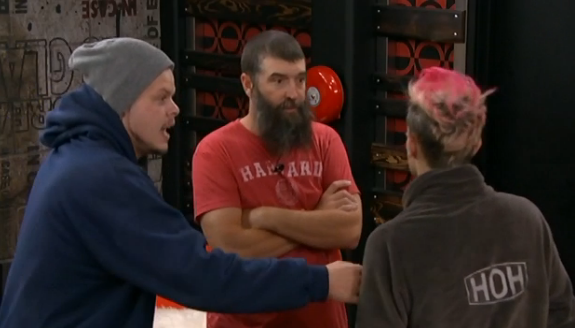 Hayden and Donny agree that when they have a shot at Frankie or Derrick on the block they won't hesitate to fire. If there is still the 'Battle of the Block' twist next week the plan for the Detonators is to put up Caleb, Jocasta, Victoria and Donny. BB wakes the HG's up around 10 AM BBT on Tuesday morning. There won't be a ton of action in the house before Thursday's eviction with most of the house in agreement that Amber will be leaving. I'm sure Amber will be running around trying to gather votes as the paranoia sets in. Also, I'm sure Jocasta isn't running around campaigning so that might be a red flag. Donny and Nicole have a conversation in the backyard about how Amber still thinks she is staying at this point and what to expect from Caleb when she leaves instead of Jocasta. I guess the HG's are doing a pretty good job at lying to her face because she has the votes counted and thinks she's good to go. Zach and Derrick plan on pulling Caleb aside on Wednesday night to tell him Amber is going home for sure. They don't want him winning the sole HOH if they're done with the twist and then puts the two of them up. 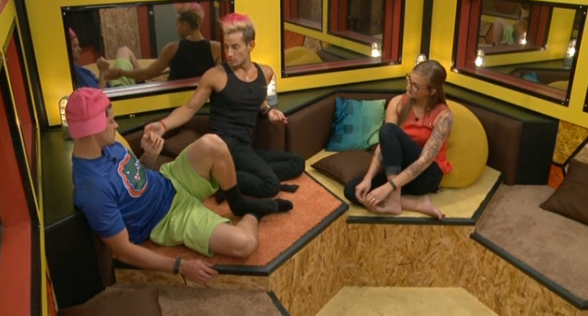 Christine tells Zach and Frankie that she wants to blindside him Thursday and not tell him the plan. (probably because she wouldn't be his target) Hayden and Cody also have a conversation in the Hive Room about how Caleb is 100% sure that Amber is safe this week. Meanwhile, Christine is in the Hive room telling Derrick and Frankie that Amber going home is not the best move for her game and that sending Jocasta home Thursday would be better for her. Derrick and Frankie say that they could flip the votes if they wanted to, just not sure it's in their best interest. It seems there may be a glimmer of hope for Amber but I wouldn't count on it. As of now it's looking like Amber will be the next HG evicted from the BB16 house. Wednesday Night's episode will show us the PoV Competition that Hayden won and him using it to pull Victoria off the block. That wraps up this weeks article, check back next week for all the new action from inside the Big Brother house for Week 6!